Feel free to contact us at (951)549-6808. Anchor Chiropractic Center in Corona, Ca. is located near the 91 and 15 freeway interchange. 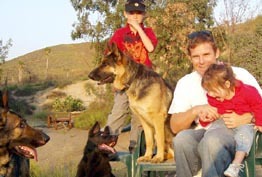 Dr. Alex Birren, Chiropractor, Serves the Corona and Norco Communities as well as many whom commute from the Inland Empire along the 91 Freeway. We are open late till 7 in the evening to serve. 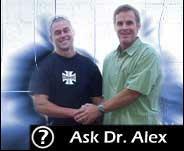 When I meet people in town, they usually say, "Oh, yeah, I know you, you're Dr. Alex. I've seen your ad with that picture of you and your children." Some people who have seen the photo tell me I should show you another one, so I said, "OK."
The little girl in my arms is my daughter, Mary Birren. The little boy behind us is my son, Brendan Anchor Birren. I named the office after him. Most parent like to brag about what their children do or achieve. While I have plenty to brag about, let me tell you what my children don't have; ear infections, asthma, allergies, tonsillitis, frequent colds and flu, or ADHD. They have had chiropracpratic adjustments since they were born. It seems too good to be true, yet other parents are bringing their children to see me for the very same reasons. Then of course, there is me, the guy in the middle. Ten years ago something happened that changed my life forever. Back then I was an engineer for a construction company in the South Pacific. My specialty was building piers, docks, breakwaters. It was a tough job. I spent my free time either surfing or diving, which was also demanding on my body. But all this activity caught up to me, and soon I found myself with a terribly painful back. In fact, sometimes my back was so stiff and sore that I had to lie on the floor just to pull my pants and boots on. The pain from my back would often shoot down my leg. I remember trying to do simple things at work that were just too painful for my back. I was scared! I was worried about losing my job, worried about doing my fair share at work, and worried I would be like this for the rest of my life. I had to do something, because it just wasn't getting better no matter what I did. I decided to give a chiropractor a try. The chiropractor did an exam, took some films, and then "adjusted" my spine. The adjustment didn't hurt, it actually felt good. I got relief. In a short time I was doing much better, and again doing well at work, and again enjoying surfing in my free time instead of nursing my aches and pains. Chiropractic worked so well, and I was so impressed, that I went to chiropractic school myself. Many people no longer have health insurance, and those who do have found that their benefits are reduced. That's where chiropractic comes in. Chiropractic may actually help you save money. studies show that chiropractic can double your immune capacity (your resistance), naturally and without drugs. The immune system fights colds, the flu, and other sicknesses. With a higher resistance, you may not be running off to the doctor as much. This is especially important if you are self-employed. .the whole ball of wax. This exam could cost you $150 elsewhere. And you'll be happy to know that I have a $35 spinal adjustment plan that many people use. We also have family plans and maintanance care plans that can further save you money. You see I'm not trying to seduce you to come see me with this low start up fee, then to only make it up with hidden fees after that. I'm a graduate of Los Angeles College of Chiropractic. I've been entrusted to take care of tiny babies to pro athletes. After practicing in Menifee for three years, I opened my own practice in Corona,Ca. I just have that low fee to help more people who need care. Call today for an appointment. We can help you. P.S. When accompanied by the first, the second family member will receive the same exam for just $27. P.S.S. Most auto accident and work injuries are cared for with no out of pocket expenses. Consultation in such matters is always free of charge.